Kaiser Chiefs frontman Ricky Wilson is reportedly considering a new career in television. The Leeds-based band have retreated from the limelight following underwhelming reviews for their third album Off With Their Heads. According to the Sun, the singer would like to stay away from music for at least two years and may concentrate on a new direction. '"He's really good on telly. Lots of people have commented on his appearances on music shows and think he comes across well," a source told the newspaper. "He's funny and has a good manner. They want to give the band breathing space and I think he could do really well on music or youth TV." It was recently reported that the band received a ticking off at a lap dancing club for breaching a "no touching" rule. Club boss Stephen Less said security staff gave them a "talking to", but added that they behaved themselves afterwards. 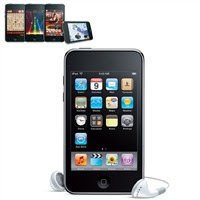 Listen to all your favourite Kaiser Chief tracks on a new iPod Touch 8GB at only £169.99! !